Thanks to the advent of digital, social and mobile communication, consumers shook the world. They’ve slayed valuable legacy brands and raised up new billion-dollar brands seemingly overnight. Read on to see how to keep your marketing on the right side of consumers. Customer centricity is spoken about at marketing industry events and often used as a buzzword for how brands should approach their marketing. What does it really mean, though? Like many marketing terms, it means many different things to many different people. While frequent definitions for the term include gaining customer wisdom, there is also an emphasis on targeting. If you’re putting customers at the center of your marketing, all promotions and messaging flow towards them in the way that is most relevant them. While it is certainly good to get an understanding of what your customers are interested in and better target messages to them, is it enough? How far must brands and marketers go to satisfy customers? A massive transformation has happened over the past few decades where previously powerful brands have been brought to their knees by customer sentiment. What is at the core of it? It wasn’t just that customers didn’t feel targeted with relevant messages or relevant products, it was the feeling that brands and marketers were not acting in their best interests. Apple overtook Microsoft. Organic food companies grew while traditional powerhouse consumer products goods brands lost billions of dollars in market value. Customers fell in love with Google thanks to all of its free products. Zappos happened. And so did Uber. These companies didn’t only understand their customers. They didn’t only put them at the center of their marketing and target and personalize effectively. They did more than create relevant products. The customer perceived these companies as putting their interests first. Let’s take a quick, deeper look at the food industry as an example. Many of its practices were sensible business practices. Preservatives, herbicides and pesticides, high-density farming, genetically modified organisms, and breeding fruit that could survive long trips and animals that would grow fast all made business sense. These practices reduced cost, lowered risk, increased margins and improved scalability. Business 101. But then consumers shook the world. Thanks to social, mobile, digital and the like, the voices they heard from about food were no longer limited to the advertising of big brands and major media outlets. Transparency to business processes increased exponentially. And consumers started realizing that all of these practices came at the expense of what customers most valued – which wasn’t scalability and reduced risk, but rather things like taste and health. In other words, these companies were not putting customers first. For more than 15 years, MECLABS Institute (parent research organization of MarketingSherpa) has conducted research to discover how people make choices and consistently found that putting the customer first led to improved business performance. MarketingSherpa has had similar findings in more than 15 years of marketing case study reporting. Customer-first Marketing (CFM) is an approach to marketing that strives for the highest degree of customer satisfaction through deep understanding of customers’ needs and wants and creating a value proposition with valuable products and services that exceed their expectations. In this approach customer needs come before the immediate gain of a business, and customer knowledge guides product development, business and marketing decisions. A CFM organization pursues long-term strategy to provide value to customers instead of focusing on maximizing its short-term revenue. As a result, CFM leads to customer loyalty, an increase in share of wallet and sustainable business success. And then, in October 2016, we surveyed two groups of 1,200 about customer-first marketing. We asked one group 50 questions about the business, marketing, and channel practices that make them highly satisfied with a company. We asked the other group similar questions about what makes them highly unsatisfied with a company. We did indeed find that customer-first marketing led to satisfied customers. In fact, reliable products weren’t even enough to satisfy customers. Sure, if you don’t have reliable products, you won’t have satisfied customers. However even if you DO have reliable products, you won’t have satisfied customers unless your business and marketing is customer first. We’ll be sharing much more of this study through MarketingSherpa over the coming months, everything from insights into data that gives marketers justification for having a seat at the table for key business decisions to why customers unsubscribe from email marketing and block online ads. But for today’s MarketingSherpa Chart of the Week article, I will focus on one key piece of data. As you can see, the most frequent response when asked about the company’s marketing was, “I consistently have good experiences with it,” chosen by 56% of respondents. When asked about the marketing of the company they were highly unsatisfied with, the top way unsatisfied customers described the company’s marketing was — not customer first — much more frequently than complaining about privacy issues or intrusive, boring or irrelevant marketing. However, the same response was the least frequent response for unsatisfied customers. Why is this? Here’s my interpretation. With our marketing, we build a relationship with a customer. And much like a marriage, there is a constant evaluation of if there is a fair and equal value exchange between the two parties. When there isn’t, it can lead to divorce. People in happy marriages and unhappy marriages can see the same situation in a different way. For example, let’s say a husband doesn’t take out the garbage. In a happy marriage, this is usually a momentary, fleeting thought or annoyance. The same may be true with companies. Once something goes wrong with customers’ experience with them, they take a harsher view of the company. And they start to not listen to the fundamentals of the marketing messages, but question their very motivations. The second most chosen response by unsatisfied customers supports this theory — “The company doesn’t make me feel like I have a relationship with them” (chosen by 34% of respondents). So why wouldn’t companies practice customer-first marketing? Customer-first marketing is no easy task. It can require short-term tradeoffs for sustainable, long-term gain and a focus on customer satisfaction at the expense of intermediate metrics (which marketers’ performance may be evaluated on). “Although ‘customer-first’ doesn’t quite capture what’s happening, what is true is that virtually all companies are trying to become less inward-looking and more market-oriented or ‘customer-focused,’” Barwise said. 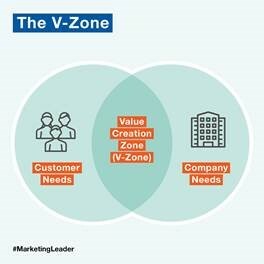 While I agree with Barwise’s assessment of the V-Zone and the necessity of meeting company needs to stay a profitable corporation, there are many times businesses and marketers will be challenged by a decision that would benefit the company (especially in the short term) at the expense of the customer. At these times, I would argue, customer-first marketing is a principle you can use as your compass. And this is what will pay off in the long run. While marketers and business leaders have good reasons to be challenged by customer-first marketing or even think it is impossible, there is one group that does think it is a realistic expectation — customers. When we asked those 2,400 customers “Of the companies you interact with, how many put your needs before their own interests in their marketing?,” only 8% of Americans reported never experiencing customer-first marketing.